I recently studied for and took the bar exam. Because I live in a rural environment, more than an hour from the nearest bar review lecture site, I decided to forego the in-person classes, and instead watched recorded lectures. I took advantage of several books that came with the program, and studied hard. This was my first time experiencing intensive study without personal interaction, and I have to admit that it drove me a little crazy. To be honest, I was surprised by my reaction. There are constantly people around my home, so I wasn’t lonely. But I was alone. While everyone around me was sympathetic to my challenge, no one truly understood what I was going through. I couldn’t bounce ideas off of anyone or talk through conceptual issues. When it came to the bar exam material, I was on my own. I couldn’t even tell if I was studying too much, or not enough. It was frustrating and a bit demoralizing. The experience made me realize then when facing something as challenging as the bar exam, being isolated is no good. The same holds true for tackling the LSAT. These tests have massive consquences for our lives, and we irrationally build them up even more into daunting obstacles to our future happiness. Walling ourselves off from the rest of the world, alone with the test, is a sure way to get bogged down in doubt and fear. It’s just too easy to lose perspective. 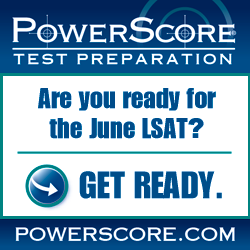 So, how can you preserve your sanity while still preparing for the LSAT, especially if you are using a self-study strategy? Reach out to people who are going through the same thing you are. Get on social media. Reach out to your friends, and to your friends’ friends, to see if any of them are preparing for the test. Get on our forum, where you can ask questions and engage with our instructors. It is absolutely free to use, but can be an invaluable resource. Continue to read our blog, and engage us in a dialogue. Whatever mechanism you choose, be sure to reach out and engage with other people to help you deal with the intellectual and emotional challenges of preparing for the LSAT. These interactions will make you less likely to feel overwhelmed or depressed, and can help you to gauge your progress and stay motivated. If you feel like you’re all alone with the test, please know that you don’t have to be. Reaching out to others isn’t a sign of weakness, it’s a critical LSAT study strategy. Photo: “Untitled” courtesy of Bodie Strain.